Kayli Akimo and her aunt Jessie are moving to Hawaii to build their dream house. She makes it clear to her matchmaking aunt that she's not looking for a man, but apparently God is on Aunt Jessie's side. Jay Mahala determines never to become involved with his clients. So when he finds himself unable to forget Kayli and a rugged firefighter pops up in her life, Jay finds that decision hard to live with. Suddenly, danger threatens and Kayli's life hangs in the balance. Who will be her true hero-the architect or the firefighter? 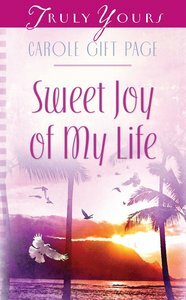 About "Sweet Joy of My Life (#849 in Heartsong Series)"